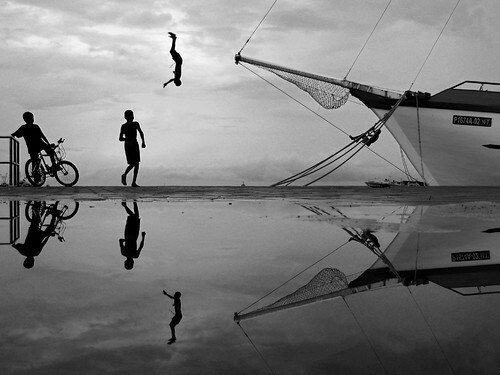 Fantastic seascape, silhouette, reflection and Black & White in one photo.. I’m so amazed. Puddle pool after the rain, originally uploaded by Ahmed Zahid. …for me, to freeze an action reflection on this dreary day at the local harbour. Hence the absence of color. The boys practice high jump, sans bungee or rope! This entry was posted on Friday, June 1st, 2007 at 11:42 pm and is filed under Inspiring, Photos. You can follow any responses to this entry through the RSS 2.0 feed. You can skip to the end and leave a response. Pinging is currently not allowed.